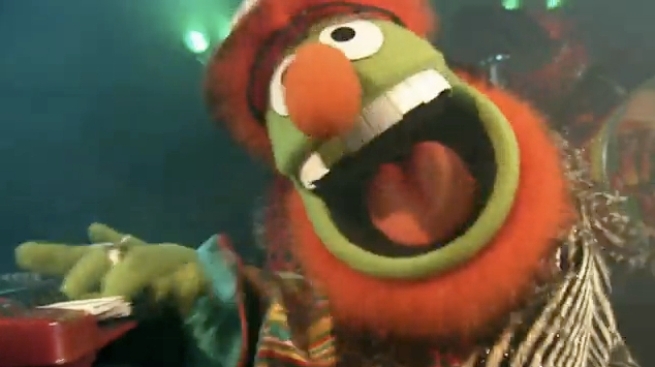 One of my favorite spots in the Mission is the Muppetly named "Dr. Teeth and the Electric Mayhem." It's over on Mission between 19th and 20th. They have great food, (that will probably kill you) a nice friendly, and shuffleboard. My only complaint has always been the lack of Muppet's in the place. I mean, if you're going to have a name like that, you really need some kind of Muppet theme going on! Well, I may get my wish. For just one night, it seems there will be muppets. According to the Uptown Almanac, a crew of puppeteers and filmmakers will be premiering a puppet-filled music video at Dr. Teeth's on Saturday. "My friend Adele and I wanted to make a music video featuring puppets. We weren't commissioned to create it---we just thought it would be fun. We picked Anita Ward's "Ring My Bell" for the music. This means the video probably won't be allowed on YouTube, but whatever. The video features puppets (Lucy and Mr. Pink) that I purchased and made. The couple hangs out in the Mission after meeting on "OkStupid." We filmed all around the Mission including Dolores Park, where random park-goers were eager to participate. We also filmed at the new bar, Mayhem, on Mission and 19th. The owners have been nice enough to allow us to celebrate the video and screen it there this Saturday night around 9:30." Hey, one night of hipster puppets is better than a night of no puppets at all. See you there! Here's a preview for now. An OkStupid Date Trailer from Kori Valz on Vimeo.